A Clone of Xerx’ses via a Spell of Legend. Physically he is identical to Xerx’ses in every way. Kom’var is completely aware of his existence as a clone and possesses all of Xerx’ses’ memories up till his creation. 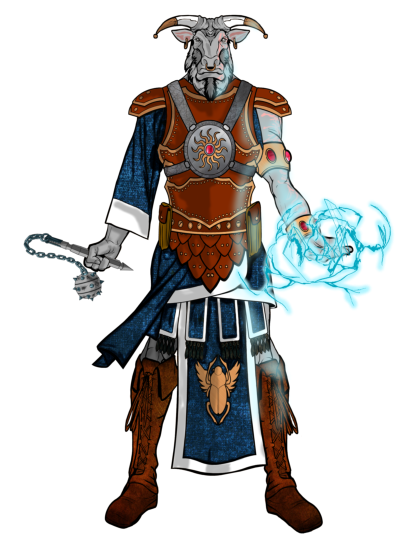 He know all of his spell magic, but is half of his creator’s rank (level) as wizard listings are stated among the Tri-Arcanum Guild at the time of his creation. He understands that given his creator that he has roughly 16 years of life given unto him, and their is a growing chance he may become a fully living creature having developed a soul through existing via the legendary magic. His life goal as set by his master/creator is the safeguarding of the ship Rogtilda and those aboard it. Only with Xerx’ses permission is he allowed to leave the ship, unless they are not docked and he is rescuing a crew member that has fallen overboard to return them to the ship. CYNIC 4D6 See “Item” Page. - Total Bonus 4D6 (+13) +11 to Str, +12 to Parr, +11 to Ent. Throwing Daggers 2D6 Has two. - Total Bonus 2D6 (+13) +10 to Str, +13 to Parr, +11 to Thr. Can blind 1 person/animal each casting. The victim will be temporarily blind; – 5 to strike, – 10 to parry and dodge, and likely to stumble and fall for every 10 feet ( 3m ) of movement ( 50%chance ). Does not affect people inside a force field, vehicle, or behind locked doors. If the blind spell is cast upon another spellcaster he cannot use any spells which require his vision while blinded. If the blind spellcaster uses any defensive/assault spells, such as magic net, call lightning, fire ball, carpet of adhesion, etc., there is a 1-65% chance that spell will be misdirected and strike his own comrades. Req: The amulet must be made of one metal purified by fire or made of semi-precious stone. Charm: Bonus of +1 to save vs. magic & psychic attacks. P.P.E.Cost: 290. Protection from Faeries: Bonus of +1 to save vs faerie magic & faerie food. P.P.E.Cost: 290. Protection from Magic Insanity: Bonus of +4 to save against all magically induced insanities. P.P.E.Cost: 320. Protection from Sickness: Bonus of +6 to save vs magic sickness and +3 to save vs disease. P.P.E.Cost:290. Protection from the Supernatural: Bonus of +2 to save vs HF. P.P.E.Cost: 300. See the Invisible: Enables the wearer of the medallion to see the invisible. P.P.E.Cost: 500. Sense the Presence of Spirits: Amulet changes color whenever a ghost, Will-O-The-Wisp, the essence of an alien intelligence or entity(s) is in the area. Range: 200 foot (61 m) radius. P.P.E.Cost: 310. Turn the Undead: A charm that will prevent any of the undead from physically touching them while they wear or hold the amulet. The amulet works much like a cross does against vampires. Effective against all undead, including mummies, zombies and vampires. P.P.E.Cost: 400. (0.6 m) tall, long or wide. Once an object is transformed into a talisman, the mage can empower it with one magic spell. The spell can be selected from levels one through eight, excluding illusion types. Of course, to implant the spell the sorcerer must already know it and it must be a spell invocation, not a ritual. After its initial creation, the talisman can be used to cast its one spell for a total of three times. After all three have been cast, the object is drained. The mystic who created the talisman can replace the exhausted spells by casting the same spell invocation combined with part of the talisman spell or ritual. The cost to recharge/replace the magic is 50 P.P.E. plus the cost of the spell invocation. Note that the process must be repeated for each of the three identical spells (each at a cost of 50 P.P.E. plus the spell’s P.P.E. cost). Thus, to recharge all three identical spells would cost 150 P.P.E. plus, but this process can be spread out over a period of days to avoid draining the mage of his P.P.E. reserve. The aspect of “three spells” may be the source of legends that grant three wishes. A talisman can be used for one purpose other than spell storage. The mage can elect to make it a potential psychic energy battery. Instead of spells, the mystic can put up to 50 P.P.E. into it, plus expend 50 P.P.E. in the storage process. The talisman can then be used at a later time to bolster the character’s normal P.P.E. reserve. A talisman that is a P.P.E. battery can never hold spells, and vice versa. A talisman can be destroyed by smashing it. That’s all there is to it. A talisman will work for anybody, but only the sorcerer who made it. or an alchemist, can recharge it. Xerx’ses can instantly transport himself and up to 2000 lbs (900 kg), per level of experience, hundreds of miles away. Xerx’ses can teleport himself alone, or other people and objects within 20 feet (6 m) of him. The total number of people and items which the character can teleport is limited by the amount of weight he can handle (2000 lbs per level of experience). 1. Teleporting to a familiar location, or a destination visible from one’s starting point: 99%. 2. A place visited only a few times before (2-6 times): 85%. 3. A place seen in a picture (the picture is being looked at during the moment of teleportation): 80%. 4. A place never visited before, but described in detail: 58%. 5. A place never before visited and known only by name or from a brief description: 20%. 1-40 Appears at the wrong place. No idea of present location; 3D6xlOO miles off course. 41-75 Appears at the wrong place. No idea of present location; 1D6x100 miles off course. 76-98 Teleport several feet above the ground; everybody falls, suffering 2D6 damage. 99-00 Teleport into an object; instant death!